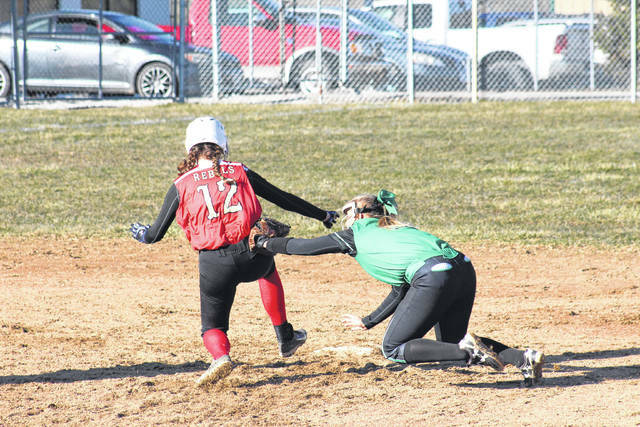 Eastern senior Cera Grueser (right) tags South Gallia freshman Chloe Payne (12) at second base, during the Lady Eagles’ 11-1 victory on Tuesday in Tuppers Plains, Ohio. TUPPERS PLAINS, Ohio — Not every team can start the season with a win. 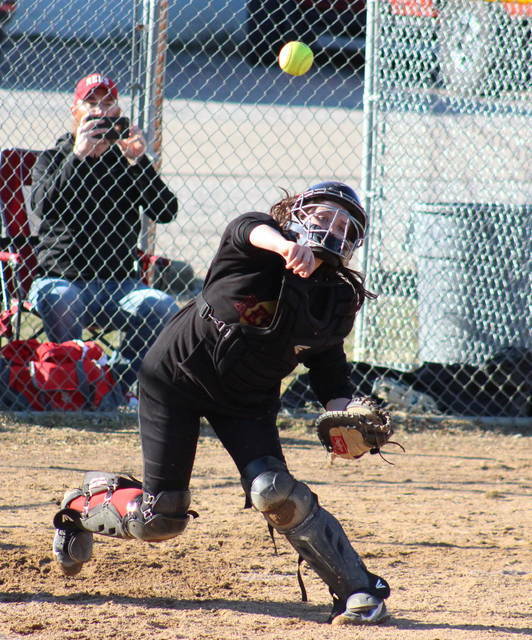 The Eastern and South Gallia softball teams met for each team’s season-opener on Tuesday at Don Jackson Field in Meigs County, with the host Lady Eagles taking an 11-1 mercy rule victory in Tri-Valley Conference Hocking Division play. 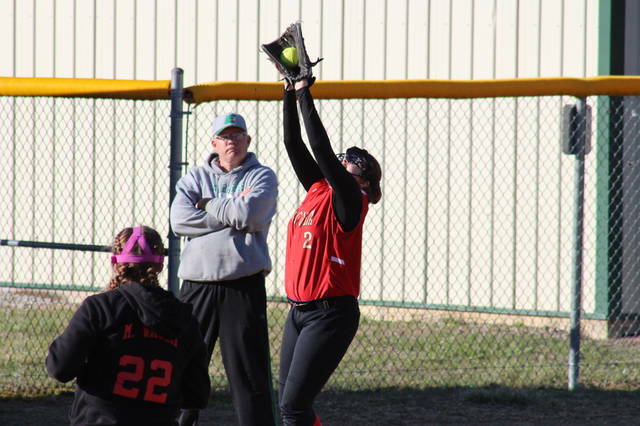 The Lady Rebels (0-1, 0-1 TVC Hocking) — who were set to open the year on Saturday at Miller, but were forced to reschedule to April 13 — took a 1-0 lead in the top of the first inning on Tuesday. Eastern (1-0, 1-0), however, plated seven runs on the strength of five hits in the bottom of the first and didn’t allow a Lady Rebel to reach second base again in the game. 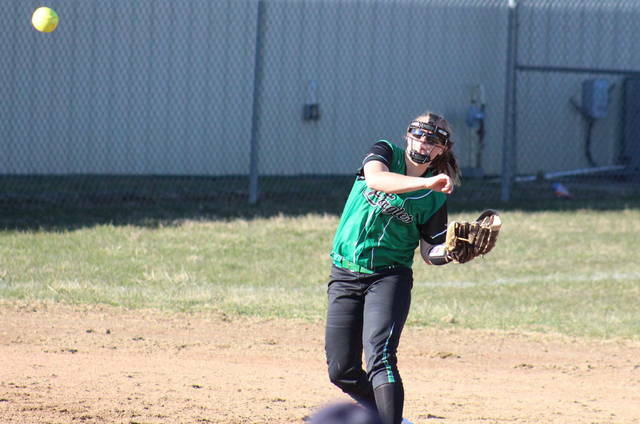 EHS was held scoreless in the second and fourth innings, but plated one run in the third and three runs in the fifth to seal the 11-1 mercy rule win. Megan Maxon earned the pitching victory in four innings for Eastern, allowing one unearned run and a pair of hits, while striking out two batters. Tessa Rockhold pitched a perfect final frame for the hosts, striking out a pair of batters. Makayla Waugh took the pitching loss in four innings for the Lady Rebels, allowing eight runs on nine hits and six walks, while striking out five batters. Madisyn Spurlock tossed the final frame, allowing three runs, one earned, on two hits and a walk. Cera Grueser led Eastern at the plate, going 3-for-3 with a double, a triple, three runs scored and one run batted in. Mollie Maxon went 2-for-3 with a triple, a run and a game-best three RBIs, while Tessa Rockhold tripled once, scored once and drove in a run for the victors. Megan Maxon, Kelsey Roberts, Emmalea Durst, Kennadi Rockhold and Ally Barber each singled once in the game, with Roberts, Maxon and Durst earning an RBI apiece. Roberts scored twice in the win, while Durst, Kennadi Rockhold, Megan Maxon and Alexus Metheney each scored a run. Waugh singled once and scored once for the guests, while Chloe Payne added a single. Each team had an error in the game, and Eastern was responsible for all-8 runners left on base. These teams are scheduled to meet again on April 11 in Mercerville. After a trip to Belpre on Wednesday, Eastern will be back at home on Friday against Waterford. After beginning their home slate with Federal Hocking on Wednesday, South Gallia will be back in Meigs County to face Southern on Friday.